1. Explore the area immediately surrounding your client’s home. Type your client’s address into Google Maps and zoom in and out to look for grocery stores, restaurants, gas stations, factories, etc. that would be easily accessible for clients. After familiarizing yourself with a neighborhood through Google maps, it’s a good idea to visit the neighborhood, since there are things you will notice in person that you wouldn’t see just by looking at a map on a computer screen. 2. Use a map of your city’s public transportation system to inform your employer outreach efforts. Start by looking at a paper map or maps that may be available on your city’s public transportation website. Then go to Google Maps, and find transportation lines near where your clients live and follow them to see what businesses are along these routes. Another fun thing to do is to drive public transportation routes as you are doing employer outreach. Sometimes you will see businesses that may not be listed on Google Maps. 3. Search for target industries or major employers in the neighborhood, city or region where your clients live. For example you could search for “manufacturing near Pittsburgh, PA” or “Hotels in New Orleans.” Research the largest employers are in your area to see how accessible these employers are for your clients.The “What’s Hot” section of the Department of Labor’s CareerOneStop.org is a great place to start for obtaining labor market information for your area. 4. Start with areas of the city your clients are already familiar with. Take a look at a map with your client or just have a conversation to find out which areas of the city they travel to on a regular basis. If a job opportunity were to open up in an area they are already familiar with and comfortable traveling to, chances are they will be positive about that job and will be likely to be successful there. 5. Use maps to advocate for your clients. Maps can come in handy as visuals in conversations with employers or with your R&P (Reception and Placement) department. 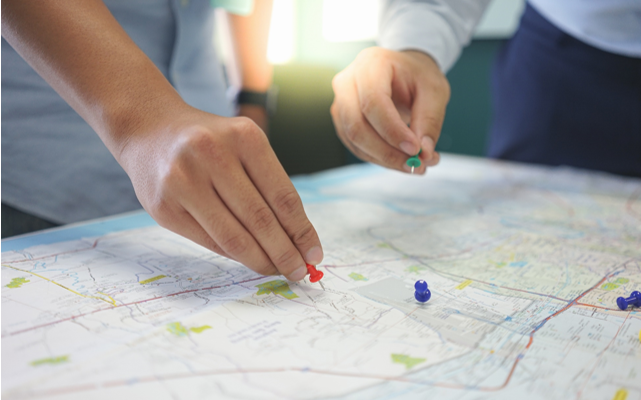 With employers, you can use maps to prove that transportation will not be a problem, pointing out the exact transportation lines that your clients will use, and that the transportation schedule will coordinate with the work schedule. With your R&P colleagues, you can use maps to show which neighborhoods are best situated for easy access to employment opportunities. Employment departments and R&P departments may want to consider doing strategy 1 (above) together as a strategy for increasing collaboration on housing and employment. One rule of thumb for public transportation: Try to keep commute times to an hour or less and avoid having clients take more than two modes of transportation (e.g. switching buses). When the commute is longer than an hour and clients have to take more than 2 modes of transportation, it is almost inevitable that they will struggle to make it to work on time or that they will end up quitting their jobs because the commute is just too overwhelming. Hopefully, these tips will help you find jobs closer to home for your clients, as well as improve job satisfaction and retention.